Here is a fun appetizer or an amazing amuse-bouche. We served this to our dinner guests recently as a lovely amuse-bouche and we’ve also served trays of them at a cocktail party. This is a true crowd pleaser! très chic!!! Give this a try and let us know what you think! For a quick demonstration of how easy this is to prepare, check out our video of Harris preparing this crowd pleaser. Brush slices of eggplant with olive oil and season with salt & pepper. On high heat, sauté eggplant until golden brown on both sides. Remove eggplant from pan and set on plate to cool. On work surface, lay out the eggplant and place cube of feta cheese about 2 inches from the end. Sprinkle with 4 or 5 toasted pine nuts and place one basil leaf on top of the feta cheese. 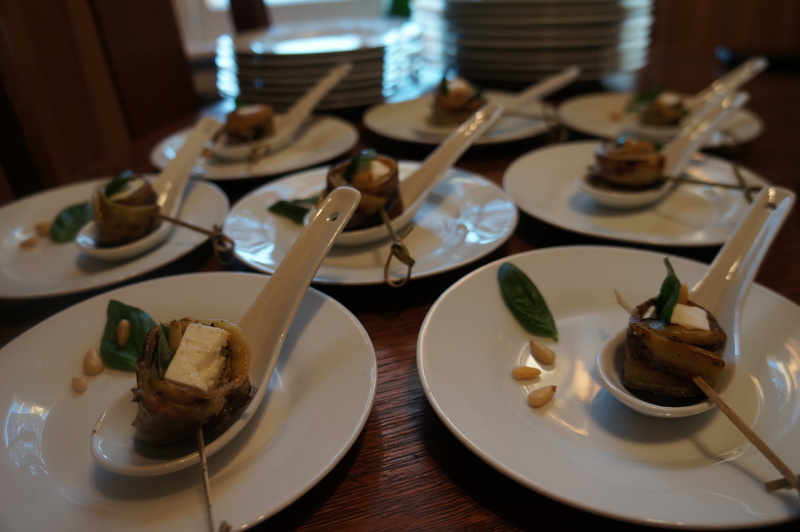 Roll the eggplant around the cheese, keeping the pine nuts and basil inside the roll-up and skewer with a large decorative tooth pick. 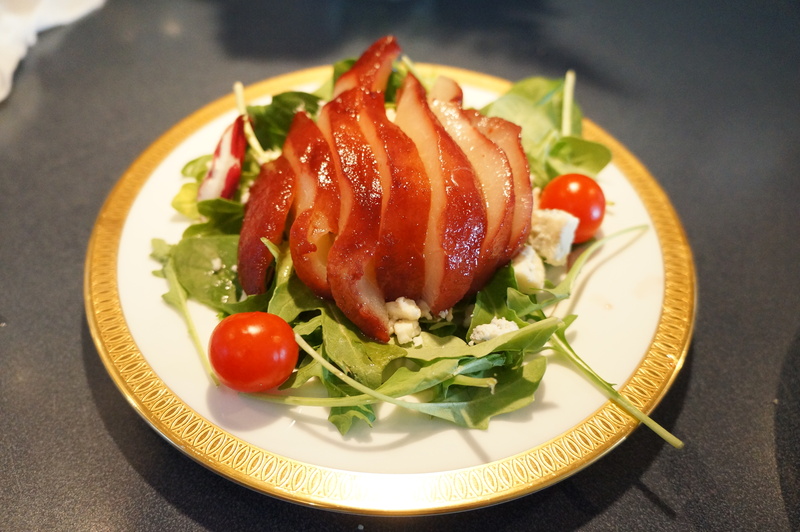 Today’s Quick Tip: Poached Pear Salad! Last month, Dave showed you how to make Princess Diana’s favorite Poached Pears that we adapted from her former butler, Paul Burrell’s cookbook In the Royal Manner. Today, we would like to present them to you as an idea for a decadent salad! Slice them up and serve as a delicious lunch treat or as a side salad with your dinner. To view the full recipe and video from Dave, please go click on the “Recipes” and “Video” tabs on the top of our homepage! Enjoy! 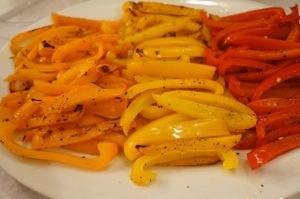 Roasted Peppers: A Colorful & Healthy Appetizer! Here is a quick tip from The Dads on Roasted Peppers! Recently we were buying sweet peppers for a couple of our recipes. We noticed the store had on sale the Trio bag of peppers in different colors. We decided that even though we didn’t need all of those peppers, it was still cheaper than buying the two individually. What to do with the extras you ask?? We sprinkled some extra virgin olive oil, Kosher salt and pepper… and roasted them in a 400 degree oven for 10 minutes. Next, we placed them on a platter and served them at room temperature. Roasted Peppers can be great make for a great side dish, but we served them as an hors d’oeuvre with the cocktails! Our guests loved them! Who would have thought something so simple and healthy could be such a big hit?! Great Party Dish: Pork Tenderloin! This past Friday we were invited to a dear friend’s 60th birthday celebration. We wanted to bring an hors d’oeuvre that would be fun and satisfying for the crowd. They were expecting over 40 guests at the party so we wanted to make a few things that would be great with drinks and be substantial at the same time! So, we made this wonderful Pork Tenderloin! We marinated them the night prior and then roasted a couple of hours before the party. This gave them a chance to rest and cool before slicing, since we wanted to serve this hors d’oeuvre at room temperature. 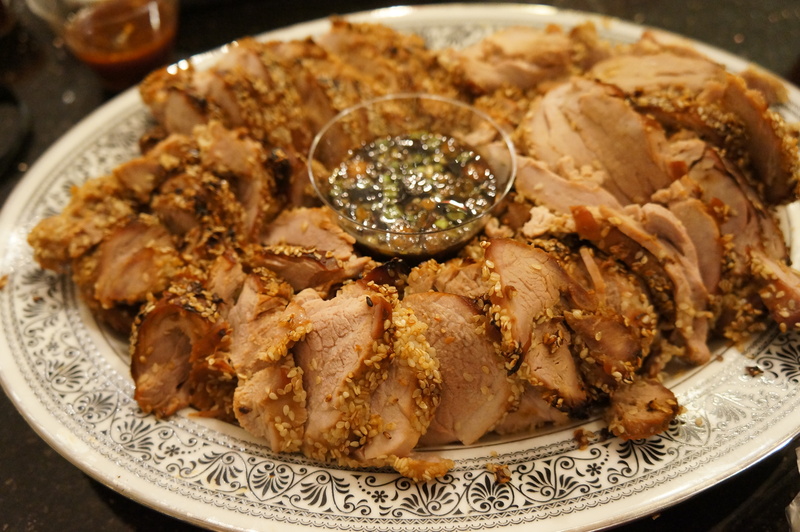 We placed the thinly sliced pork tenderloin around the platter and in the middle placed the dipping sauce. Next to the platter we put a cachepot filled with fancy toothpicks. If you don’t happen to have a cachepot, you can substitute with your favorite shot glass! Of course our second appetizer was our ever famous fresh pizza! They saw it on our blog and insisted we make that as well! Check out our Pork Tenderloin recipe below! Let us know in our comment section if you choose to make it or if you have any additional tips! Enjoy! Combine the above ingredients, mixing well. Trim two pork tenderloins (12 oz each) and place in zip lock bag. Pour into bag the marinade and allow meat to marinate for 2 to 24 hours in the refrigerator. We find it is best if you have time to allow the meat to marinade overnight. On a piece of wax paper spread uncooked sesame seeds and roll pork tenderloins in the seeds to coat the exterior. Please pork on greased baking sheet and cook for 20 to 25 minutes. Insert instant thermometer into the center of the meat to ensure it is between 150 to 155 degrees. Let meat rest for 5 to 10 minutes before slicing. The above dish is great for a dinner or served cold for a party. If you use it for a party the below dipping sauce works perfect. We recommend slicing very thin if being used for a party and serving with tooth picks. Combine all ingredients and place into a dish for dipping! 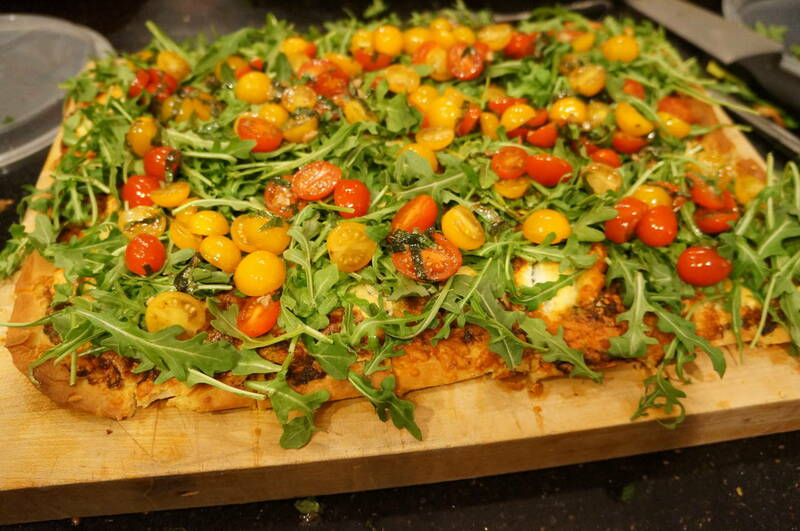 Impress Your Guests with This Homemade Gourmet Pizza! We mentioned recently that we had made a pizza from scratch for Harris’ mother’s Italian birthday, so we wanted to share our recipe with you! Gourmet pizza is always a great crowd pleaser and with Super Bowl Sunday coming up, this might be one of the best entrees to serve up! Here is our recipe that worked great for us. But the beauty of pizza is that you can dress it anyway you like, so feel free to experiment with your own variations! What’s your favorite way to decorate your pizza? Have you made it at home before? What tips worked great for you that you would like to share? Leave a comment and we will let you know if we try any of your suggestions! Pour yeast into the warm water and allow to sit for five minutes. Using a standup mixer first combine the flour and salt. Next, set your mixer to run at low speed and drizzle in olive oil until combined with flour. Pour in yeast and water until just combined. The dough will be sticky. Coat a mixing bowl with olive oil and form the dough into a ball. Toss the dough ball in the bowl with olive oil to coat the ball. Cover with plastic wrap and set aside for one to two hours. It is best to place bowl in the refrigerator 24 hours ahead for the best flavor. Punch the dough down and roll out to fit your greased pan (we used a standard baking sheet). Try to avoid stretching the dough. Preheat oven to 475 degrees. 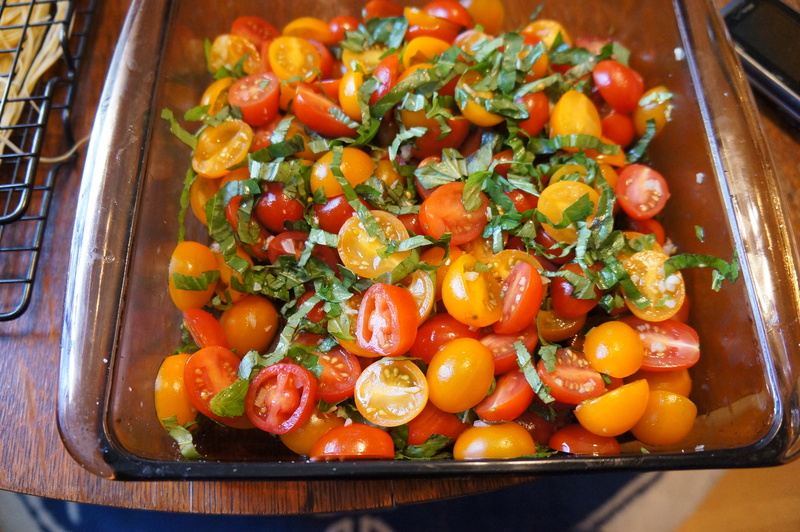 Place cut tomatoes, basil, balsamic vinegar, salt and pepper to taste in a medium size bowl. In small skillet, heat olive oil, add garlic and stir for one minute and remove from heat. Pour over tomatoes mixture, tossing to coat evenly. Set aside. Roll out dough very thin, dusting with flour and transfer to oiled baking sheet. Drizzle a little olive oil over dough and spread evenly. 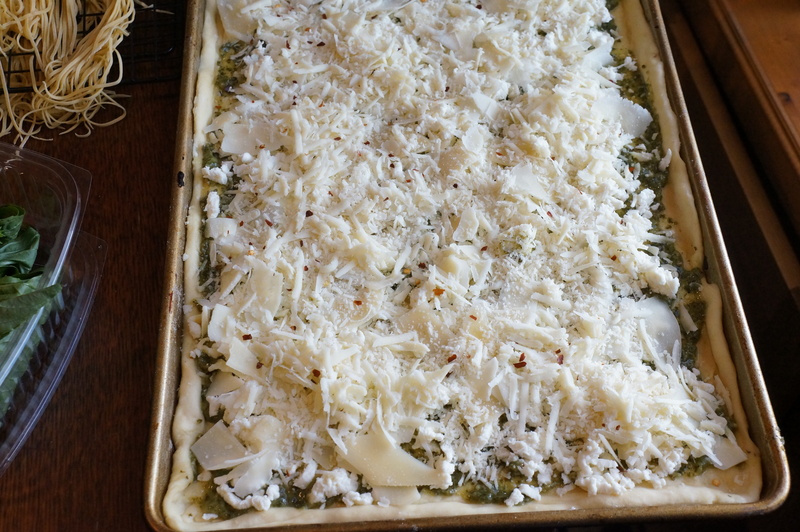 Spread pesto over dough. Sprinkle mozzarella, asiago, and parmesan reggiano evenly over pizza. With a spoon place a small amount of ricotta over the entire pizza and sprinkle with red pepper flakes to taste. Bake for 12 to 14 minutes, until the crust is golden brown. Remove from oven and allow to rest for five minutes. Then cover top with arugula, then spoon over tomatoes mixture. Cut into squares and serve. Leah Makes Harris’ Roasted Asparagus! Roasted Asparagus is one of our favorite veggies! It’s fast, easy and always a crowd-pleaser! In the video below, Leah shares the asparagus recipe that her father, Harris taught her to make. To dress up your asparagus, we suggest adding jumbo lump crabmeat, wrapping a few pieces in prosciutto, or even drizzling a little homemade hollandaise on top! Sweet & Savory: Spiced Nuts! 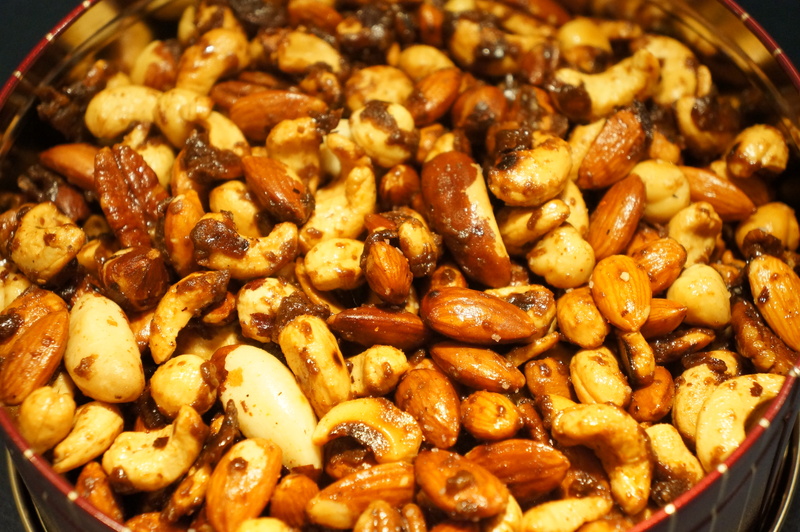 We posted this recipe before, but in the video below, Dave demonstrates how to make his famous sweet & savory Spiced Nuts! These nuts make for a great gift for friends or coworkers, as well as a fantastic snack for entertaining! Heat the nuts in a dry large skillet over medium to medium high heat and cook, stirring frequently, until they begin to toast, about 4 minutes. Add the butter and cook, stirring, until the nuts begin to darken, about 1 minute. Add the spices, stirring to incorporate and coat the nuts. Add the sugar, again stirring to coat and combine with the spices. Add the kosher salt and water and cook, stirring, until the sauce thickens and the nuts are glazed, about 5 minutes. Remove the nuts from the heat and transfer to a baking sheet lined with aluminum foil, separating them with a fork. Let the nuts stand until cooled and the sugar has hardened, about 10 minutes. If there is still butter on the foil under the nuts when cooling, use a paper towel to absorb.